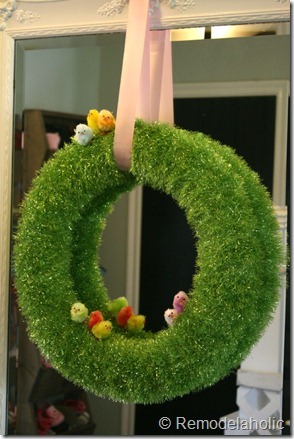 I have wanted to come up with a cute Easter wreath for several years now. It is part of my master plan for the holidays. 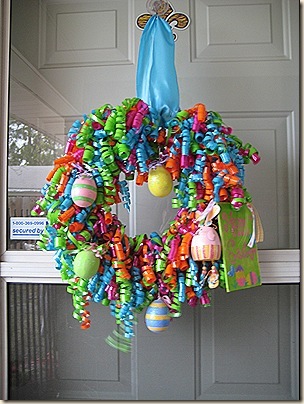 I always see Easter wreaths in the stores that are all pastels. I am not a particularly pastel-oriented person. Just a matter of person taste, but I sort of inherently dislike pastels. They always suggest “baby” to me. And until that day arrives, I plan to avoid them entirely. Anyways…. Today on Pinterest, I spotted a perfect Easter wreath, that I plan to try to make for myself soon. It comes from Remodelaholic, this grass wreath is very sweet with almost no use of pastels! I also just happen to have a wreath-form that would work for this idea (And, alas, no other idea!) It was the result of a severe miscommunication with my very sweet man when he agreed to stop by the craft store for me just after Christmas. Like I said, he is VERY SWEET, but I ended up with two very boxy small wreath forms that I have had no idea what to do with. But I think that covered with faux-grass, it might come out really cool. Another fantastic creation I found was from the The CSI Project. This picture frame based wreath has a modern twist, and manages to be pastel, without being too saccharine. From Embellished Bayou, I think this ribbon wreath is everything spring should be – bright and colorful and exuberant and fun! I think it would especially great for a house with kids.